My Rambling on the 'net: Checked your VISA statement lately...? NEW YORK (CNN) -- A technical snafu left some Visa prepaid cardholders stunned and horrified Monday to see a $23,148,855,308,184,500 charge on their statements. 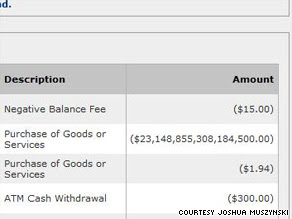 Josh Muszynski noticed the 17-digit charge while making a routine balance inquiry. That's about 2,007 times the size of the USA national debt. Josh Muszynski, 22, of Manchester, New Hampshire, was one Visa customer aghast to find the 17-digit charge on his bill. Adding insult to injury, he had also been hit with a $15 overdraft fee. He noticed that his debt exceeded the world GDP while making a routine balance inquiry on his online Bank of America account. According to his statement, he had spent the profound sum in one pop at a nearby Mobil gas station -- his regular stop for Camel cigarettes. "Very, very panicked," he jumped in his car and sped to the station.